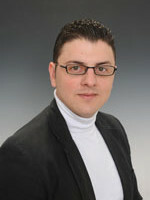 Anev Darko studied Orthodox Theology at the University of Macedonia and Catholic Theology at the University of Regensburg and the Theologische Hochschule Reutlingen. In 2013 he received his Master`s Degree in Theology at the Theologische Hochschule Reutlingen. Since October 2014 Anev Darko has been doctoral fellow in the research group (C-2) Space and Metaphor. He also has participated in the PhD program Ancient Languages and Texts (ALT) at the Berlin Graduate School of Ancient Studies (BerGSAS).